Immigrants from Africa present their intimate HIV life stories through using their own bodies in making art that matters. Their life-sized paintings are presented among other intriguing art at the latest exhibition opening of Verbeke Foundation that will run until February 2016. 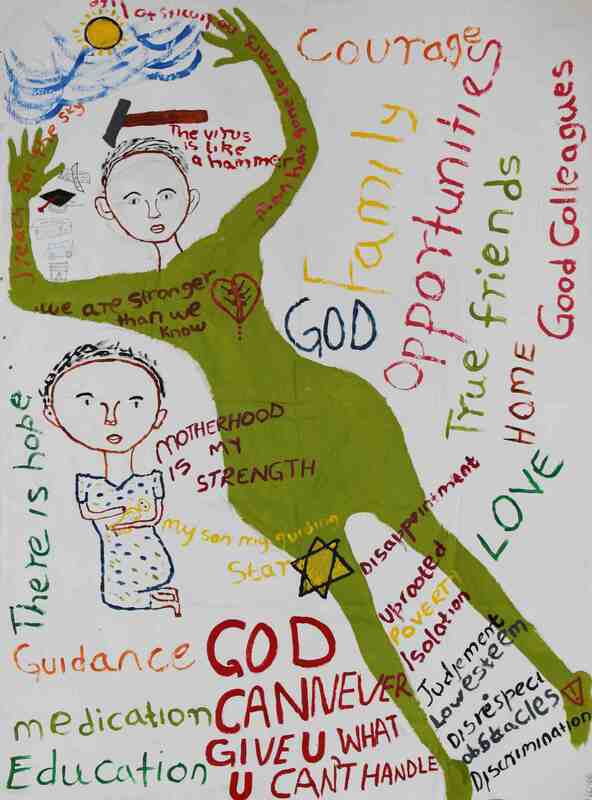 The paintings -created by HIV positive people living in Kenya, but also by immigrants residing in Belgium- are the creative results of body mapping workshops: an art therapy process in which personal -often stigmatising experiences and sensations are translated into a visual form, with the purpose of healing and empowering the HIV carriers. I have been in Belgium since 2007. I am married and have four children. Two of them are here in Belgium with us. I like to be called Mutama. Since I arrived in Belgium, other members of my community have called me like that. It means “old” and is a sign of respect. The time spent on my body mapping allowed me not to think about my problems, the bills, the phone calls. It is a time to concentrate on things that really matter to me. It was too short. I remembered hearing about HIV on the radio. I was then able to recognize my own symptoms and asked the doctor to do an HIV test. In these years, being positive was seen as a death sentence, nothing to do about it… I got a lot of infections and took many, many medications. I was always sick, always tired, always… People were saying I was lazy. In 1998, the first medication in my country became available. The doctor asked me if I could afford the medication’s financial burden because it would be for my entire life. They were very expensive, like the wages of a month and thanks to people who helped me I started the treatment. In 2000, international organizations began to finance the medication and they then were available for free. On my body map, I have symbolized the virus as something that used to be very big and has been getting smaller. It will continue to get smaller. I see a positive future, with lots of hope and power. My power, my strength is in my brain. I want to remain active, to continue to inform people about HIV. I am very eager to see my children growing up. On my painting, there is a lifeline and next to it, the banana plantation where I used to work, it reminds me of my country, the smell, the colors, the food. My lifeline is made of many ups and downs, but now it is going up, steadily. I am in Belgium and under good medical care. I take my pills as if they were sweets. They keep me alive. Using drawings and paintings have really helped me to find a way to express myself. The last day, I felt like an artist! “Mutama” is a recognized refugee and still lives in Antwerp, Belgium. He is a valuable volunteer to the HIV-SAM Project of the Institute of Tropical Medicine, which organizes HIV prevention activities specifically for sub-Saharan African migrants. He is particularly active in the patient support group “Muungano”, where he is one of the group’s enthusiastic volunteers. I have been in Belgium for eleven years. I have known my status also for eleven years. I am the fourth child, the first girl after three boys. Everybody was praying for a girl, my parents, grandparents…everybody cherished me. I used to work for the HIV-SAM Project, but now I am based in the UK. I have a son who is 19 years old. I have strong foundations thanks to my family, my son, God and friends who are always there. I am now the strongest woman I know. I remember, when I arrived in Belgium, someone who became a close friend chose to call me Leentje. It comes from my real name Helen. It felt so sweet and lovely, so I have kept it. It gives me a sense of belonging. Being part of the HIV-SAM project, I have always been seen as a strong source of support for other community members living with HIV. But with the body mapping, I have shown some of my weaknesses too. I am a family person, these are the people I belong to. 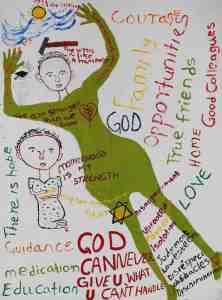 I want to do body mapping with my family to get to know each other better. The drawings can improve communication. HIV has uprooted me from my comfort zone. HIV brought up leadership skills in me. Yet, sometimes I feel contaminated, unlovable. I want intimacy, belongingness. In my painting, I have visualized HIV as a hammer, when you want to put your head up, it knocks you down. 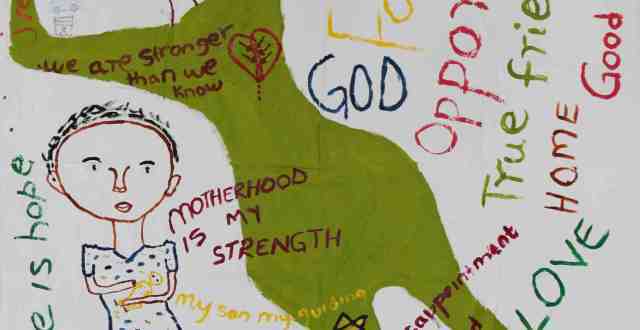 My strength is my motherhood, if you want to climb you need a strong belt. My strong belt is my child. I have painted my son in yellow because he is my sunshine, my star. I have also drawn a broken heart that is bleeding because of the spears that keep on attacking. She still lives in the UK and works for a national HIV advocacy for HIV positive women. We came to Belgium in February 2009. 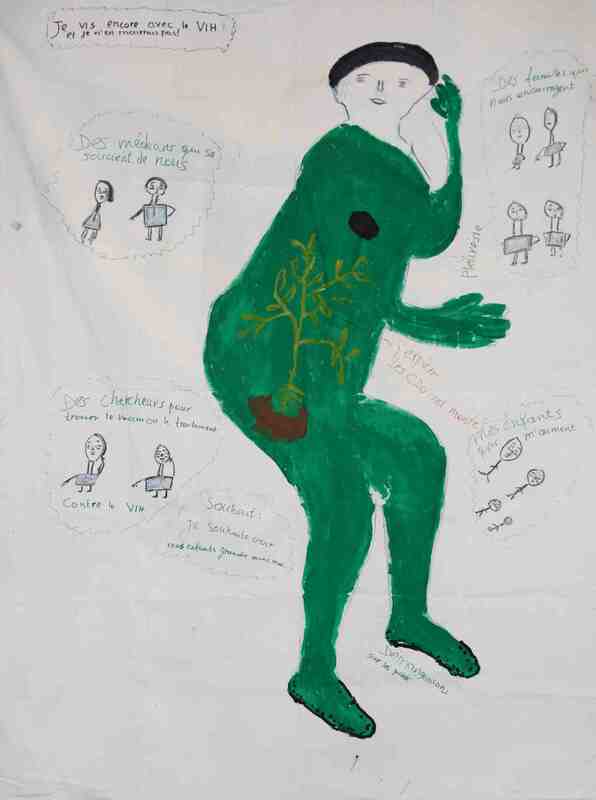 I am the wife of one of the participants in this body mapping workshop (see body map 2) and we have four children. The older ones are in our home country and the two younger ones are with us in Belgium. I started taking medication in February 2010. The Body Mapping was very enriching, I was able to share and listen to other stories, we discovered many similarities. These drawings are very simple with little symbols but the explanations are very rich. They are small things with a big meaning. The black spot symbolizes where the virus started, it was a problem with my lungs. People tell you to eat well, but people don’t have enough money for it. Now I have found my strength back, I have hope and energy. I am taking my medication and with time I also put on weight. I have symbolized these changes as a tree, a tree that grows and grows. The bigger it gets, the better it is. First it is small and green and as it grows more and more, there is more hope. The little figures on the side are the support I have been receiving: doctors who help me, researchers who are trying to find a solution for better treatment and on the other side, my family with my children. This workshop has helped me to express myself more than usual and to accept my condition. The sharing was important. To talk about myself through drawings is really new to me. She still lives with her family in Antwerp. She is an active member of the patient group Muungano, which is supported by the HIV-SAM Project of the Institute of Tropical Medicine. 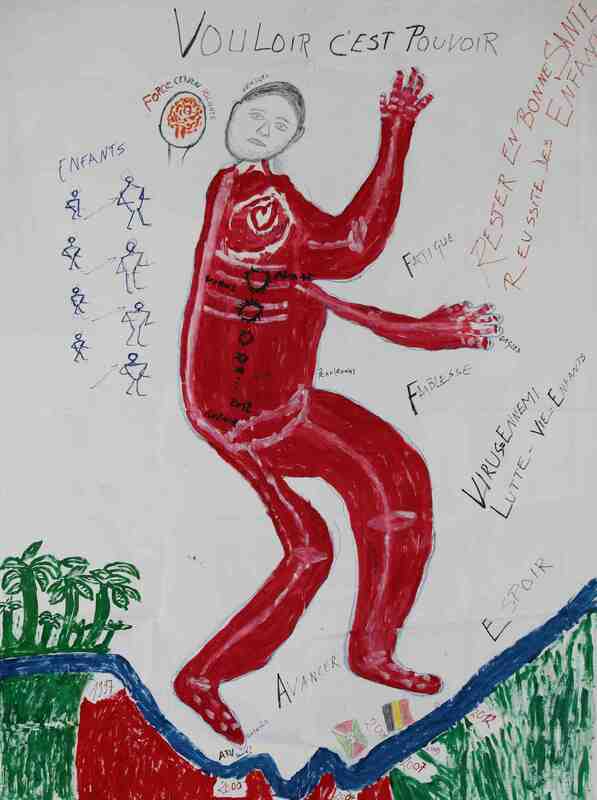 ‘Our Bodies’ was organised by Arts2be and the Institute of Tropical Medicine Antwerp through the guidance of Xavier Verhoest of Art2be, in collaboration with the HIV-SAM project.